Maintaining a high level of security is imperative at any property. A great place to start in ensuring your security is up to standard is to choose an effective, fully functioning garage door. Garage doors come in a variety of styles and designs, with all of them offering a number of advantages. Here at Bullet Garage Doors, we’ve been installing doors in garages in Harpenden and throughout Bedfordshire for over fifteen years; this means we’ve got the experience and know-how to provide you with the best possible solution for your property. We provide and install both modern and traditional doors, meaning that we’ll have something to suit your property and your personal taste. Our team is also made up of individuals with a great amount of experience in the field. As a result, we’re more than happy to offer some impartial advice about the best style for you. We won’t push any of our products just because they’re more expensive, and we’ll always ensure that you make the final decision. Our help with your garage doors doesn’t stop after we complete our installation, either. Our 12 month guarantee means that, should any minor issues arise with your new door, we’ll come out and fix it for you. Customer service is extremely important to us, and we have an outstanding track record in that department. If you'd like to hear what our previous customers have to say about us, check out our testimonials page. Existing garage doors that aren’t fit for purpose also pose a potential security risk to your Harpenden property. Doors that are old, stuck, or more seriously damaged aren’t effective at keeping your home safe, so Bullet Garage Doors offer a garage door repairs service, too. We’ll always endeavour to get to you as quickly as possible to ensure security at your premises isn’t compromised for a long period of time. Helpfully, we’re located a short way down the London Road and A5, meaning we’re generally able to get out to your home without a long delay. 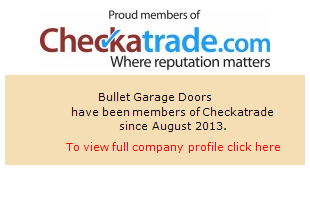 For stylish garage doors and comprehensive garage door repairs throughout Harpenden, contact Bullet Garage Doors today. Our friendly, professional team are always happy to speak with you, so give us a call on 01582 932025 or get in touch via our online contact form. Removed old door and frame and old fascia and fitted new door. This was complete with matching steel frame and two point locking to give more height and fitted new upvc fascia. Efficient, courteous and prompt. Excellent job, thanks.